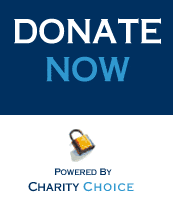 At WSB we feel that by providing awareness training to as many people as we can is vital. It is important for people to know about sight loss, especially children, as ‘blindness’ is one of the hardest disabilities for sighted people to deal with. We find that by taking the time to explain to people the reasons behind why someone may lose their sight, and describing how they live their lives can completely change people’s idea of sight loss. Not everyone with a visual impairment has a guide dog, white cane and big dark glasses and it is important to get this message across as people’s perception of blindness is often misleading. Only 4% of ‘blind’ people cannot see anything, most have some form of vision and lead a very productive ‘normal’ lifestyle. For more information, to book, or to find out where we will be attending next, please call us on 01922 627 683. 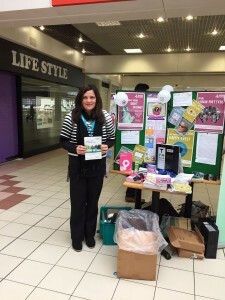 Walsall Society for the Blind is proud to be a part of the seventh annual National Eye Health Week (18 – 24 September). The Week aims to raise awareness of the importance of having a regular sight test and inspire people to make healthier lifestyle choices that benefit their eye health. Almost two million people in the UK are living with sight loss yet over half of sight loss can be avoided, so it is vital everyone takes care of their eyes. 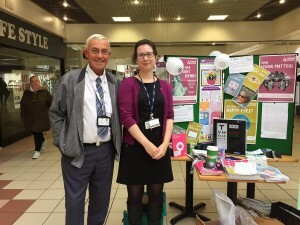 We were at the Saddlers Centre in Walsall Town Centre on Wednesday 20th and Thursday 21st September, along with Walsall Local Optical Committee, Sensory Services, local Opticians and Public Health Walsall. 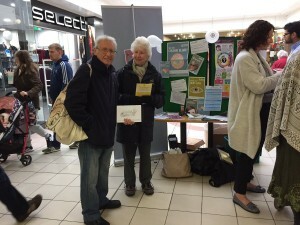 Thank you to everyone that stopped to say hello and enquire about how to keep your eyes and vision healthy and the services available. 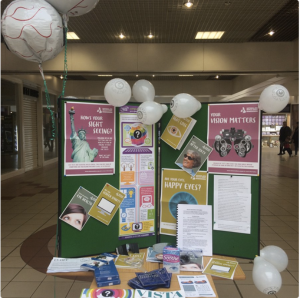 The seventh annual National Eye Health week took place 19 – 25 September 2016 and we joined together with Specsavers and local Opticians, to promote the importance of eye health and the need for regular sight tests for all. 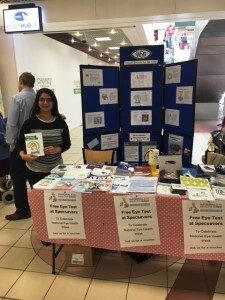 Along with local Optometrists and Opticians, we held an information stand within the Saddlers Centre, Walsall and over a 3 day period we received 360 enquiries, as people expressed an interest in eye health care. 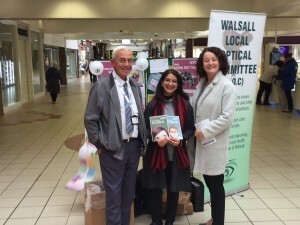 The uptake of sight tests by the over 60 population in Walsall has approximately halved over the last 5 years. The general population are recommended to have their eyes checked every 2 years, however those aged 70 and over are recommended to have annual sight tests. If you are over 60 you are entitled to a free eyetest. Diabetics are at a higher risk of eye health problems and are entitled to free eye health checks, it is important that these health checks are attended regularly. Persons on certain benefits including income support benefit and job seekers allowance are entitled to free sight tests. If required, persons on these benefits are also entitled to optical vouchers to help towards the cost of glasses. Persons with a family history of glaucoma are 4 – 9 times more at risk of glaucoma than persons without a family history. Therefore, persons with a direct family member who has glaucoma are entitled to free sight tests.